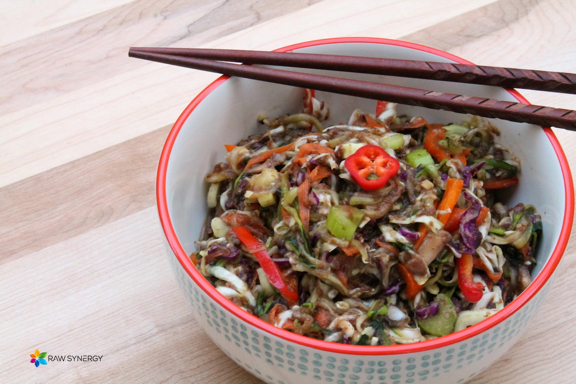 Chinese food was always a favorite of mine before following a raw food diet, so I was super excited to find this incredible dish from The Raw Caterer, which I purchase often at my local farmers market. It’s so delicious! It’s definitely one for those who like SWEET, savory meals. I keep begging them to release a recipe book because their food is SO GOOD! Hopefully someday soon, they will. Until then, they were so kind to share the ingredients used in this recipe. However, I don’t know their exact measurements and because I’m making much smaller batches, I had to modify the ingredients a little to be able to blend it properly. This is reminiscent of the sweet dishes you might find at PF Changs or other Asian restaurants. * For the mushrooms, I actually prefer the flavor and texture of dried mushrooms. I like to dry shiitake mushrooms in the dehydrator and then slice them and mix them in with the noodles and sauce. They taste more mild and I like the consistency better. I also slice and then dry portobello mushrooms too. I’ll break them up and put a small handful in the dish instead of shiitake. Button mushrooms will also work great if you decide to go this route. If you like fresh mushrooms, no need to dry them, just slice and add them to the dish. You can also slice and marinate fresh mushrooms in tamari, or coconut aminos, for 20 minutes before adding them to the noodles for enhanced flavor. Combine zucchini noodles, cabbage, bell pepper and mushrooms in a large bowl. I sometimes like to add thinly sliced celery to this dish for added flavor. For the sauce, using a small blender like a Nutri Bullet or Smart stick, blend raisins, mango, tamari, garlic, jalapeño and ginger until smooth or almost smooth. Pour over noodles and mix gently until all ingredients are combined well. Sauce will be thick but once properly mixed with zucchini noodles, it will thin out and cover noodles well. That’s enjoy your meal in Chinese! I made this salad and loved it. I’m so happy to hear that! Thank you for sharing!